THIS IS AN ORIGINAL- BEWARE OF FAKES! A reprint, and, it's. A bootleg, this is the REAL McCoy. 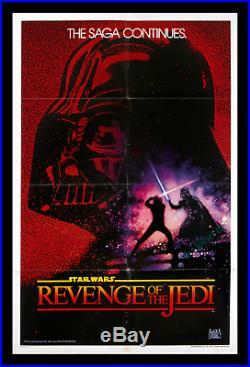 The "Revenge of the Jedi" one-sheet is the most copied, commemorated, and, the most counterfeited movie poster in the world! That's because it's so great! It's always been a huge demand item - the unbelievable artwork by Drew Struzan, coupled with the film's "politically correct" title change, make this one for the record books. First printing (No-Date) Revenge of the Jedi one-sheets are the most valuable of the original trilogy one-sheets. "NO-DATE" - IT'S THE HOLY GRAIL OF "Star Wars" ONE-SHEETS! Fox issued the Revenge of the Jedi teasers back in 1982. There were TWO versions of the one-sheet printed. 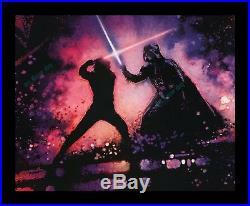 Both are somewhat documented on the 1985 Lucasfilm authorized Star Wars Checklist poster. THE FIRST VERSION (no-date): It was p rinted ONLY once - BEFORE 20th-Century-Fox settled on a certain release date for the film. THE SECOND VERSION (with the date): was printed as soon as they [Fox and Lucasfilm] finalized the May 25th release date. The first NO-DATE version offered here is SIGNIFICANTLY rarer. In fact, it's one of the rarer and most sought after Star Wars posters in the hobby! The Star Wars Checklist poster states that. There were ONLY a handful of these no-date posters made. The story gets even better! After going through the trouble of printing both versions of the poster, George Lucas had an eleventh hour epiphany when he suddenly realized how silly it would be for a Jedi to loose his cool seeking REVENGE, and so he changed the title of the movie to The Return of the Jedi. " Immediately, all the original "Revenge posters (date and no-date) were pulled from the official advertising campaign. This particular NO-DATE original has been coveted ever since all that hubbub initially happened. This fantastic rarity is in C-8 VeryFINE+ to. This poster has been perfectly protected since 1982. I've kept it FLAT between acid-free in a giant pack with 70 other one-sheets, as to prevent the folds from weakening. It hasn't seen the light of day in over 35 years! The defects are the typical minor scuffs and flaws you'd find with any typical 1980's one-sheets. The poster is very solid. In fact, if this were simply linen-mounted it would present at least a SOLID NearMINT CONDITION! Get it from a genuine Star Wars poster expert! If you've been looking for a Revenge of the Jedi - MAKE SURE IT'S REAL! I admit my prices are somewhat advanced, but the service and guarantee I provide is equally advanced. It more than makes up for what appears not to be a bargain price. I say "appears" because it's my sincere belief that it's a bargain to be certain in what you're getting. Certainty is what all the fuss is about when it comes to certifications on autographs, baseball cards, and, comic books. It's what all three of those collectible industries solely rely on. There is NO other dealer in the country that can say the same! I'm a well-known expert. In fact, I'm the #1 genuine Star Wars poster expert in the world! Additionally, I fully designed and authored a Star Wars poster-collecting guide back in 1999 - It was published by Butterfields. I'm credited in the front of the guide. I offer that guide with some of my listings see a photo of it in my listing with the. 1976 ORIGINAL Star Wars Corporation FLYER. I point this out because I want you to know that I can definitely authenticate Star Wars posters with 100% accuracy. THIS POSTER IS THE REAL DEAL. To BEWARE of any dealer who advertises a Star Wars poster as a bootleg. These are greedy dealers who think it's OK to destroy the hobby by circulating bootlegs because they tell you upfront that it's a bootleg. They're knowingly distributing bootlegs for personal profit. It's criminal and unscrupulous. Some poster masterpiece sellers think it's OK because they say they stamp the back as fake. It's again, distributing bootlegs knowingly. That's NOT integrity - that's BUNK! I wouldn't trust them unless they stamped the FRONT of the poster with a mark that clearly states, BOOTLEG! - like they do with fake coins and currencies in that well-established hobby. Help stop this criminality - speak out! I 100% guarantee the authenticity of this poster. And - ALL MY OTHER VINTAGE OFFERINGS!! If you're looking for an investment/museum quality item. "Star Wars: The Last Jedi, " starring Mark Hamill - in what hopes to be the performance of his lifetime - is due out for release this December. The film is already causing quite the buzz around Hollywood. Talk of an Oscar nomination is already in the air for the veteran actor as he reprises his signature role in this new large scale 21st century big-screen production. If that's not enough, additionally, Disney is constructing the TWO (2) world record largest theme parks ever built, and both are going to be 100% dedicated to Star Wars! When that happens, this poster will inevitably be a HOT PROPERTY. Let's face it, it's red hot now, but it will undoubtedly become a white. Hot mamma when we round that bend. So pick it up now while it's still obtainable. Please write with any questions. If you're in the market for top quality original vintage movie posters or Star Wars, then please. 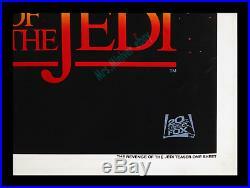 The item "STAR WARS REVENGE OF THE JEDI No-DATE! GENUINE 1st PRINTING MOVIE POSTER" is in sale since Wednesday, April 04, 2018. This item is in the category "Entertainment Memorabilia\Movie Memorabilia\Posters\Originals-United States\1980-89".miniver" and is located in Studio City, California. This item can be shipped worldwide.